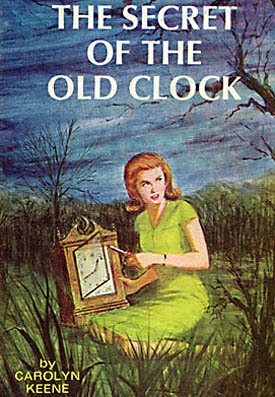 The Secret of the Old Clock by Carolyn Keene. Grosset & Dunlap, 1930. Currently available. There is also this cover, which I don’t remember seeing as a kid, but I found it easily online. I think that both of these old covers have tremendous appeal. Nancy is fully visible (no cut off body parts on these covers). She is also actively engaged in the scenario – the pictures are relevant to the plot and show a young woman acting independently. From her stance and facial expression, we can tell that she may be in danger, and that makes it even more appealing because we can tell that she’s taking a great risk and being brave about it. Contemporary publishers, take note! It’s cool to have illustrated covers showing girls (with whole bodies) being active. Does it break the slate? I can’t decide. It is difficult to judge the Slatebreaking qualities of an 82-year-old book because I just do not know enough about the cultural context at the time of publication. In 1930, this book was tremendously Slatebreaking. But in 2012 its Slatebreaking status is hampered due to some outdated gender and class depictions. And because it is the first book in the series, Nancy is just getting started as an outstanding Slatebreaking female. 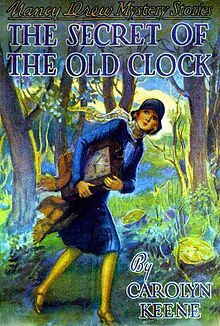 Ultimately, Nancy is a Slatebreaking character, but the story surrounding her in The Secret of the Old Clock is not Slatebreaking. Who would we give it to? Nostalgic folks, like myself, who were into Nancy Drew as a kid and want to relive the joys of childhood reading. I honestly have no idea if the original Nancy Drew books would appeal to young readers of today. There are a lot of Nancy Drew updates, including graphic novels and detailed digital gaming versions, floating about. These revitalized versions of the classic Nancy may have more contemporary appeal, but there’s something about the original Nancy that may attract young readers who are just beginning to explore the mystery genre. 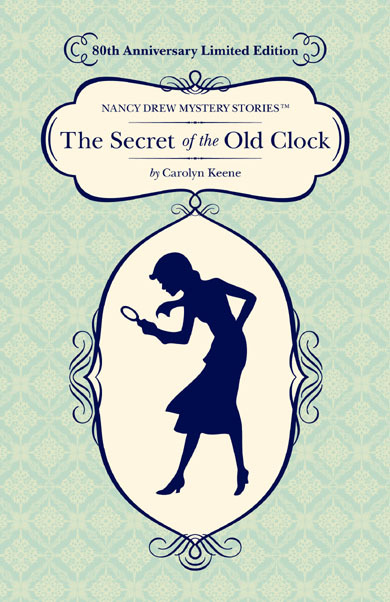 While re-reading The Secret of the Old Clock, I realized that some of my favorite aspects of the series don’t make an appearance in the inaugural Nancy Drew story. Bess and George, Nancy’s best friends, are nowhere to be found. There are no references to Nancy’s gorgeous Titian hair. There’s also no Ned, Nancy’s boyfriend. (Actually, I thought that was fine. I could do without Ned Nickerson – and in my opinion, so could Nancy!) But there were still some of the familiar elements that I remembered and fell in love with all over again. There were the luscious descriptions of Hannah Gruen’s delicious cooking. Each chapter still had the suspense of a mini-cliffhanger ending. And Nancy still sped down the local roads in her beloved convertible! What shocked me during this re-reading was Nancy’s obvious class privilege. It is astounding to me how spoiled Nancy is. When I was younger, I admired Nancy’s freedom to drive around River Heights and hunt down clues. Now I wonder why she won’t just go and get a job already if she’s so bored. Nancy’s summer is so blissfully unscheduled that she voluntarily runs business errands for her father, meets people for lunch at upscale restaurants, and even takes off for a week to stay at a camp with her pals. Whenever she needs nurturing or a hearty meal, she goes home to her doting live-in housekeeper Hannah. Speaking of Hannah: I don’t understand what Hannah Gruen does all day. There’s no way that one teenager and her father, who are both out of the house most of the time, make enough mess to keep a live-in housekeeper busy! The central conflict of the story also focused on class and money. Nancy, a wealthy young woman, used her time and financial resources to “save” a bunch of families with few financial resources. And Nancy’s enemies were two teen girls who were hoping to inherit a lot of money. The contrast between these girls, who came from a family in which money was passed on, and Nancy, whose father was a “self-made man,” was hard to ignore. There was a strong emphasis on class differences throughout the book, and it made me feel uncomfortable as a contemporary reader. Nancy is also a remarkably clever young woman. Her quick thinking and spot-on intuition are traits that help her get to the bottom of any mystery. It’s great fun to read along with her thought process as she seeks out clues. Her father also values her intelligence and often relies on her to solve problems he encounters when working on a case. That unique father-daughter relationship, in which critical thinking is highly valued, is another strong Slatebreaking aspect of the book. Any parent-daughter relationship in which the daughter is valued for her smarts instead of (or in addition to) her sweetness and attractiveness is a very good thing. It’s a challenge to revisit beloved childhood books because they do not always live up to your memories. There were definitely some of those moments while reading The Secret of the Old Clock, but the old charm that won me over when I was a kid is still there. Nancy Drew has been breaking slates for decades and she won’t stop anytime soon. Reviewed from a copy purchased at Changing Hands bookstore. This entry was posted in Middle Grade, Reviews and tagged Carolyn Keene, Middle Grade, Mystery, Nancy Drew, nostalgia. Bookmark the permalink.